H: When we heard Sensei Michele was teaching tonight we said it would be a Yummy Class. Me: Did you say Yummy Class? What’s a Yummy Class? H: In yoga, when we have an easy class we say it is a Yummy Class. You have been a disappointment! Me: I think I’m proud of that! 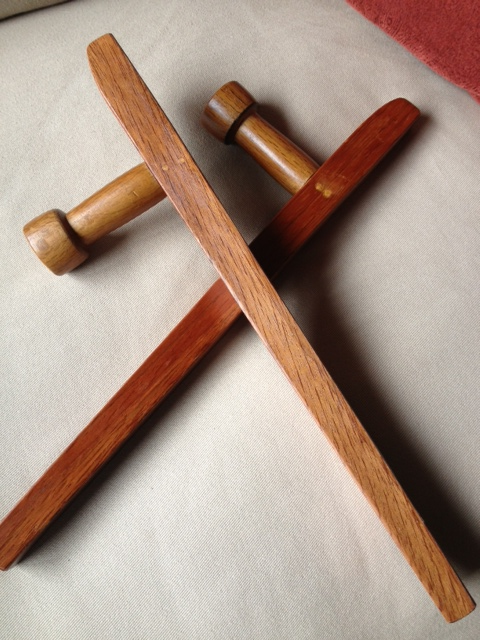 I have new walking buddies – my tonfa! I like to walk after dark, and even though I’m in a safe neighborhood, I’m still just a delicate flower who appreciates a little extra protection. So far I’ve had about 20 minutes of instruction and have been shown a couple of patterns. Renshi said he’ll teach us more when we get the patterns down, but until then we just need to keep practicing those over and over. I was going to work on the patterns in the living room but it was so nice out I wanted to go for a walk. I figured I could get the feel of the tonfa while I walked and if I was coordinated enough, I might even be able to work the patterns. I started out slowly, just trying to get used to the weapons, then started working the patterns. I was worried I might hit my knee, but surprisingly I didn’t! I did, however, hit my elbow. Once. Which was enough, because when Wooden Tonfa meets Elbow, Elbow loses. Because I live in Podunk, I kept waiting for Deputy Barney to pull up and ask what I was doing. I tried my best to look “normal” by swinging my tonfa when I was in less-lighted spots, and just carrying them when I walked under streetlights. My buddies and I made some pretty funny shadows – I was a 15-foot giant with really long arms! It’s not the first time I’ve practiced my karate while I walk, since I’m usually working through combinations or blocks, but it’s the first time I carried weapons. So either the neighbors are used to the “crazy karate lady” wandering the streets or they were so busy wondering who in their right mind would go out in public dressed in a red hoodie, brown t-shirt, fuschia shorts and bright pink shoes that they failed to notice my walking buddies. Now that I know I can walk and swing a weapon at the same time without breaking a knee or falling on my face, I’m sure I’ll do it again. I’d like to walk with my sai but I probably shouldn’t; I have a feeling those might attract a bit too much attention. But do you suppose anyone would notice if I walked with my bo? That might sound silly, but if you’ve ever had an acrylic nail pop off unexpectedly, you know how much it hurts. For those of you who have never experienced it, consider yourself lucky. Or smart that you don’t indulge in fake nails. But trust me on this one — I’ve had it happen a few times, and I can honestly say it hurts more to have a nail rip off than it did to break my nose or my toe! Well, just the big toe. The little toes really hurt when they get broken! But those breaks are a story for another time. 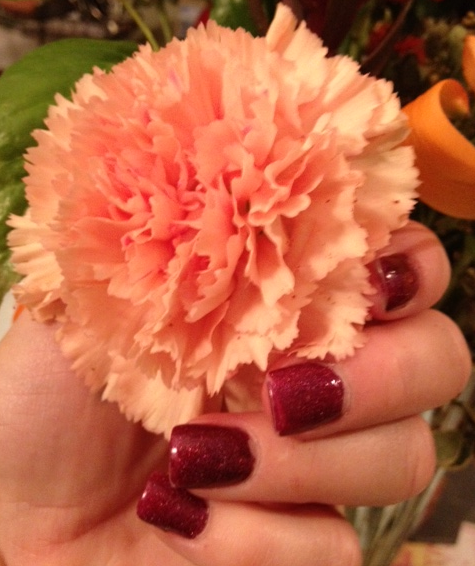 Tonight, I’m just happy I made it through one really “fun” afternoon of mowing and yard work with my polish intact. See? It still looks great!